He was so stunned by the families’ plight that, in 1964, Franks found ten like-minded Directors who shared his vision for a community that cares about all of its citizens, and together they formed a non-profit foundation. During its first year, Franks anonymously made two donations, totaling $100,000, for the architectural design and building located on twenty-six acres in east Redmond, where our main headquarters, and park are still located. Dozens of local residents, business people and service club members built the original structure, free of halls, to accommodate up to fifty children. With classrooms, kitchen facilities, and a multipurpose area, the children finally had a place to learn, socialize, and recreate with their peers. In 1967, the foundation added what may be the most important of its services for adults with disabilities – jobs. Adults with special needs were offered paying jobs tailored to their abilities. This would be the beginning of services for adults at the Opportunity Foundation. Today, the Opportunity Foundation of Central Oregon is a thriving nonprofit organization with over 270 supported persons. 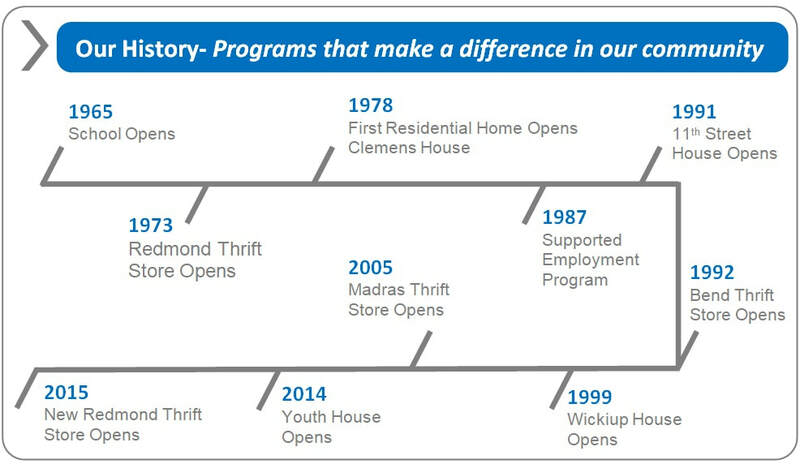 We own and operate 8 residential homes, 3 thrift stores, and a variety of employment programs and services. Our Behavior Consultant Team not only works with the people we support, they offer their expertise and consulting services to other agencies and providers in the tri-county area. Our Supported Employment Program is dedicated to finding community-based jobs for all those individuals who can, and want, to work in integrated settings.